When I was 12, my parents bought me a gigantic Yiddish-Russian dictionary. Maybe this was their way of compensating for the fact that they had not told me I was Jewish until second grade, when I came home singing a Ukrainian ditty with the word “zhid.” Or maybe the gift was inspired by the Soviet Union’s collapse, which made it possible to purchase such a dictionary in a regular bookstore. That year, I spent many afternoons trying to memorize the words that began with alef. I had a craving for a Jewish language—as identity, as an answer of some sort—and I knew that neither Russian nor Ukrainian would suffice. Needless to say, neither the alef words of Yiddish nor the shreds of Hebrew I picked up in the newly opened Sunday school helped me very much. That same year, my parents gave me a volume of Isaac Babel’s short stories. The book was handed to me with a gesture that suggested the reverence one reserves for ritual objects—and with a certain glee that seemed to undercut the reverence. And there it was: Babel’s Russian was the first Jewish language I could come to call my own. 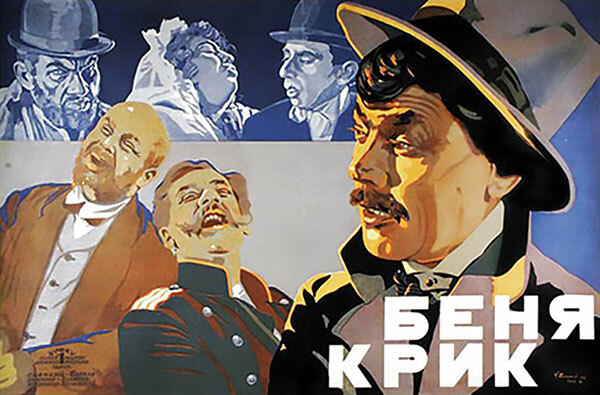 Movie poster advertising Benny the Howl (1926), based on Isaac Babel’s The Odessa Tales. Both my grandmother and my aunt taught Russian language and literature in high school. Along with my mother, who grew up in their menacingly pedagogic shadow, they were exacting in their demands on my Russian, which was to be grammatically impeccable and spoken with a properly modulated Slavic diction at all times, whether I was tagging along to the marketplace or reciting poetry. Babel offered an alternative that was revelatory. I may have intuited that the deliberately broken and Yiddishized Russian spoken by Babel’s characters was, like all such creoles or patois, not a sign of backwardness or a symptom of a lack of education. Instead, this was a way one could carve out a self within a culture that seemed to swallow you whole without ever accepting you. I couldn’t fully understand any of this at the time, of course, but I’ve been thinking about it a great deal lately as I read Val Vinokur’s new translation of Babel’s stories, The Essential Fictions. To translate Babel is to attempt to invent, or reinvent, a language—a Jewish language—particularly given Babel’spredilection for marrying the argot of the underworld with highly sophisticated narration. What would its English equivalent be? Saul Bellow’s high-low American English? Jackie Mason’s tonalities? Mickey Katz’s lyrics? Yeshiva talk? None of these seem quite right, but it is clear that Vinokur is willing to experiment. There is an iconic scene in “The King”: A nameless young man interrupts Dvoira Krik’s wedding celebration. He gets Benya’s attention with a phrase that betrays a Yiddishism lurking behind it, with two twisted conjugations and a well-misused word. There isn’t a trace of this in Peter Constantine’s fine 2002 translation, but Vinokur takes a chance with “I got a couple things to tell you.” The dropped preposition may not create a sense of an invented language, but it hints at something lurking underneath, as does, for example, “Benya, you know what kind of notion I got? I got a notion our chimney’s on fire,” which, too, is smoothed over in Constantine’s work. As I read Babel’s Odessa stories in the book my parents gave me, I became more attuned to our older relatives, the ones I saw on our annual pilgrimages to the small village of Haschevato, where my father’s family has its roots. Every year we gathered at the local cemetery, near the mass grave where members of our family who had been too old or reluctant to evacuate during the Holocaust are buried. There, a large wall bears surnames that were very familiar to me, along with first names, of the sort I only encountered in Babel’s work. The elderly relatives I met there, those of my great-grandparents’ generation, spoke Russian much like Babel’s characters did. Listening to them, I understood that the reason my parents had given me this book with such reverence had something to do with these relatives. He did, however, allow his Jew to speak, occasionally dropping what Karpenko-Kary thought to be Yiddish, or Yiddish-sounding, phrases that elicited much mirth from my classmates as we read the play out loud and recited monologues by heart. To this day, I feel the cold sweat on my neck and the paralyzing shame shooting through me when I think of that play. If I could go back in time and say something to my terrified 13-year-old self, I’d begin with Babel, whose brilliant appropriation of Russian was the real mic drop to Karpenko-Kary and others like him. [If] you need my life you may take it, but everyone makes mistakes, even God. A huge mistake has been made, Aunt Pesya. But wasn’t it a mistake on God’s part to settle Jews in Russia and let them be tormented worse than in hell? And would it have been so bad if the Jews lived in Switzerland, where they would be surrounded by first-class lakes, mountain air, and nothing but Frenchmen? Everyone makes mistakes, even God. Listen to me with your ears, Aunt Pesya. The first Jewish language I learned was the language of mistakes. Mistakes that turned, in defiance, into pure poetry. Jake Marmer is the author of Jazz Talmud (Sheep Meadow Press), a poetry collection. His recording Hermeneutic Stomp was released by Blue Thread Music in 2014. He teaches at Kehillah Jewish High School in Palo Alto. Helps me understand what it was like to be Jewish in Russia. Thank you, Jake Marmer. though, “That is not what I meant, at all,” might well have been his counter-ooze. T. S. Eliot was more successful, almost reaching seventy-seven. and with the failure paid the price---their lives. What else is news?